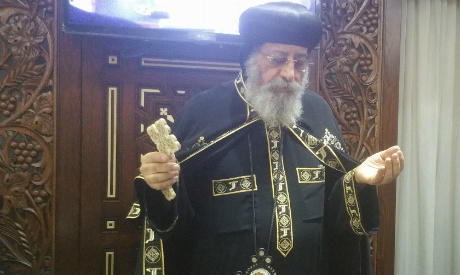 The Holy Synod of the Coptic Orthodox Church, chaired by Pope Tawadros II, decided on Friday to make 15 February “an annual commemoration of all contemporary martyrs." Following their annual assembly, the synod published a statement explaining they chose the date to honour the memory of the Libya martyrs, a reference to the killing of 20 Egyptian Christian hostages on 15 February 2015 by Daesh in Libya. The meeting of the Holy Synod, the authority in the Coptic Orthodox Church which formulates rules and regulations regarding matters of the church's organisation and faith, was attended by 109 senior clergy. Daesh militants have carried out a number of deadly attacks against Egyptian Christians in the last six months, leaving more than 100 dead and dozens injured. The synod also decided to create a special department within the General Bishopric of Social Services "to care for the families of martyrs and confessors, and also to create comprehensive historical documentation for all those incidents, to commemorate our martyrs and injured,” a statement published on the official Facebook page of the church's spokesperson said. "This meeting comes while the country and the Egyptian church are going through painful circumstances as a result of the consecutive terrorist attacks on our churches and our children all over Egypt," the statement added. On 26 May, gunmen driving three 4x4 trucks halted a bus carrying Coptic Christians in Egypt’s Minya governorate and shot the passengers. Thirty Christians died as a result of the attack, and 21 were injured. The militant group Daesh claimed responsibility for the killings. In April, 29 worshippers died in a suicide bombing at a church in the Nile Delta city of Tanta, while another suicide bomber attacked St Mark's Cathedral in Alexandria on the same day, killing 18 people. The incidents were also claimed by Daesh. The Holy Synod also expressed their appreciation for efforts to support Egypt's Copts. "We thank all authorities, institutions and persons, inside and outside Egypt, who have helped and supported the sons and daughters of the church in these dire circumstances." In response to the Minya attack, the Egyptian airforce carried out intensive strikes on "terrorist bases" in Libya, which authorities say were involved in planning and executing the attack. "We pray for the peace and growth of God’s one and holy church and for the protection of our beloved nation Egypt," read the statement.